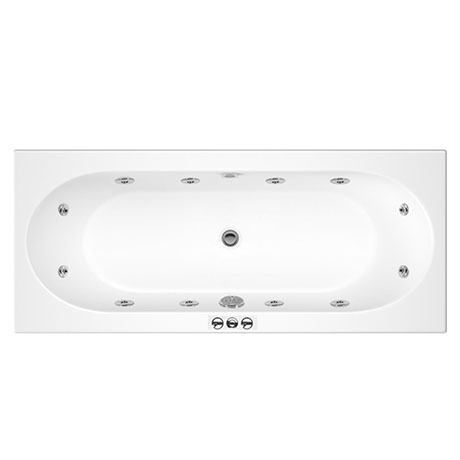 The luxurious Laguna 12 Jet Whirlpool Round Double Ended Acrylic Bath is an exciting new addition to our range of hydrotherapy bathroom products, enabling your body to be massaged and invigorated relieving muscle fatigue and all kinds of aches and pains through the wonderful healing power of our hydrotherapy massaging water systems. This bath is fitted with 12 whirlpool jets giving a great massage. The bath has been made from lucite acrylic and is Supplied Un-Drilled. A winning combination of the latest bathroom fashion look with cutting edge technical innovation. Supplied with Leg Set. Whirlpool baths should never be operated unless the jets are completely submerged. Good solid bath with the added bonus of bubbles. This system is great & was the cheapest I could find for a 12 jet system. Easy to install but remember to purchase the taps & waste.